Jonny Wilkinson will forever be remembered as the man who kicked England to Rugby World Cup glory in Australia in 2003 - slotting a last-gasp drop goal in extra-time to edge out the hosts in a thrilling tournament finale. Regularly a left-footer, the talented fly-half slotted that memorable kick with his right foot to cement his place in English sporting history. That moment is just one highlight of a record-breaking career that has seen Wilkinson rise to one of the sport's all-time greats. Wilkinson won his first cap against Ireland on April 4, 1998 aged 18 years and 314 days to become England's second youngest player - narrowly missing the record held by Harlequins' Colin Laird who debuted in 1927 aged 18 years and 124 days. A young Wilkinson was a member of the England touring party that endured the so-called 'Tour of Hell' in 1998 that saw them suffer heavily at the hands of Australia, New Zealand and South Africa. But it proved to be a learning experience for Wilkinson, and by the end of 2001 he had eclipsed the England Test points record of 396 held until then by his mentor Rob Andrew. In March 2008, he became the all-time leading Test points scorer, overtaking Wales' Neil Jenkins. His first converted penalty against Scotland at Murrayfield, took him three points past Jenkins' tally of 1090 Test rugby points. This achievement came a little earlier than expected after the IRB granted full Test status to the 2005 British and Irish Lions warm-up Test against Argentina. Wilkinson also scored a record 29th Test drop goal against France in the 2008 Six Nations Championship - surpassing the record he had shared with Argentine legend Hugo Porta. He also holds the Rugby World Cup points record with 249, capturing the record previously held by Scotland's Gavin Hastings during England's 2007 quarter-final victory over Australia. He is also the only player to score points in two Rugby World Cup finals - scoring four penalties and that famous drop goal in the 2003 victory over Australia and two penalties in the 15-6 loss to South Africa in 2007. He has also toured with the British & Irish Lions twice - to Australia in 2001 and New Zealand in 2005 scoring 67 Test points in the 6 Lions Test matches he has started. Following that memorable night in Sydney in 2003, Wilkinson's career was blighted by injury. Knee ligament, arm, shoulder and kidney problems meant he did not appear again for England until 1,169 days later in their opening game of the 2007 Six Nations Championship against Scotland on 3 February 2007. 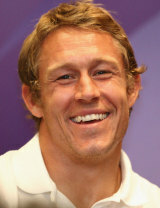 In his comeback England match, Wilkinson scored a Calcutta Cup record of 27 points in a Man-of-the-Match performance. The following week against Italy, he became the highest point-scorer in the history of the Five/Six Nations Championship. Injury problems returned later that year but he battled back to be part of England Rugby World Cup squad that surprised many as they made their way to the final where they were beaten by the Springboks. Wilkinson was subsequently under pressure from a new generation of stars targeting the No.10 shirt. One of whom, Danny Cipriani, displaced him for the final match of the 2008 Six Nations Championship against Ireland. And he was ruled out of England's summer tour to New Zealand instead opting for shoulder surgery at the end of the season. Wilkinson was retained as a member of the England Elite Squad by manager Martin Johnson in the summer of 2008 but his injury woes returned to haunt him in October of that year when he suffered a dislocated knee injury on Premiership duty for Newcastle. That injury ruled him out of action for eight months, including the 2009 Six Nations and the British & Irish Lions' tour to South Africa. He returned to the international stage at the end of 2009 and retained his place for the 2010 Six Nations during which time he eclipsed Ireland's Ronan O'Gara as the all-time leading scorer in Championship history. But question marks over his form saw him dropped for only the third time in his career for the final clash with France. He toured Australia that summer but shoulder injury would sideline him for the end of year internationals as Toby Flood cemented his place in the side. Wilkinson was forced to adapt to a supporting role but he continued to have an impact on proceedings - landing a long-range penalty with his first touch during the Six Nations victory over France in 2011 which also saw him reclaim the all-time Test points record that he had previously lost to New Zealand's Dan Carter. During a disappointing World Cup for England, Wilkinson started four of England's five games including the quarter-final against France. The fly-half struggled from the tee, however, and was part of the 'ball tampering' scandal which hit England during the tournament following his misgivings over the state of the World Cup balls. And on December 12, 2011, Wilkinson announced his retirement from international rugby and will focus on his club career with Toulon. In March 2013 Wilkinson signed a new one-year deal with the French side after deciding to prolong his career. Wilkinson played all of his club rugby in the Premiership for the Falcons who he joined straight from school in the summer of 1997 at the age of 18. With them he has won the Premiership title (1997-98) and the domestic cup competition (2001 - injury ruled him out of their 2004 victory) but most recently they have struggled to compete for the big honours. He brought his 11-year association with the club to an end in 2009 by signing a lucrative two-year deal with French Top 14 club Toulon. He returned to action for his new club in June 2009 and was re-called to the international set-up the following month by Johnson. Despite slipping behind Toby Flood in the international pecking order he remained an important figure at club level, winning admirers among the French press and also signing a contract extension until 2013 despite the RFU's policy on not selecting overseas players post World cup 2011. Wilkinson announced his international retirement following the 2011 World Cup but continued to shine for Toulon and opted to sign a new one-year contract in 2013 that he celebrated by steering the club to Heineken Cup glory - clinched with a 16-15 upset of French rivals Clermont Auvergne in Dublin. Wilkinson slotted an incredible 17 penalties in-a-row in the knock out stages of the competition - plus two drop goals - and was rewarded with the European Player of the Year honour. The 2003 IRB Player of the Year and BBC Sports Personality of the Year, Wilkinson has also had an unwavering commercial presence since arriving on the international stage with companies keen to be associated with the England stalwart. The famously tee-total Wilkinson has endorsed many products, provided exclusive newspaper columns and published several rugby books and DVDs.